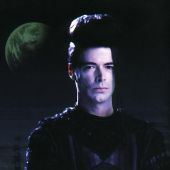 Musicvideo - Poetman's Prose - Main Lexx Discussion - You have arrived in the LEXXVERSE where the spirit of Lexx lives on. Hey Squish - you really did a great job so far! Nice work! And I like Clint Mansell as well! Excellent Video Squish and Perfect for the eZine issue to be released this weekend! Gave you another like on the Tube! You guys are just the sweetest. Thanks so much, I'm really enjoying making these videos. Album "Metal Opera Part I"
There is a complete discography out on some torrent files - good stuff! It's actually from Metal Opera II, and I got it in iTunes instead of as a torrent, but that's cool, it all works the same way in the end. Stay tuned, Bilbo, this is gonna be real good! I'll actually have some great video's to add to the eZine! That "Lost in Space" song is indeed pretty good and would be great for a video of the entire Lexx crew. I've decided on Rammstein for my Prince vid. You may be the only one in the Lexxverse (besides me) who understands the lyrics, but the music is just so awesome, I have to use it. I definatley can imagine that "Spiel mit mir" would match to Prince! My Prince vid is finished and, in my humble opinion, it's just hunky dory! Hunky dory in the sense that it's freakin' HAWT!! I'm finalizing it now and will post the link as soon as I get it uploaded to YouTube. Bilbo, you MUST watch it, considering I made the whole darn thing just for you. Ok, Lexxians, here it is!! Kewl prince video, I think the music is right up Bilbo's alley. Nice Video! Glad you did it!